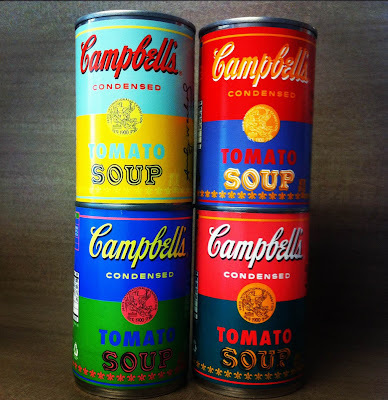 If It's Hip, It's Here (Archives): Campbell's Warhol-Inspired Soup Cans Are An Old Recipe. How Are These Different? Campbell's Warhol-Inspired Soup Cans Are An Old Recipe. How Are These Different? 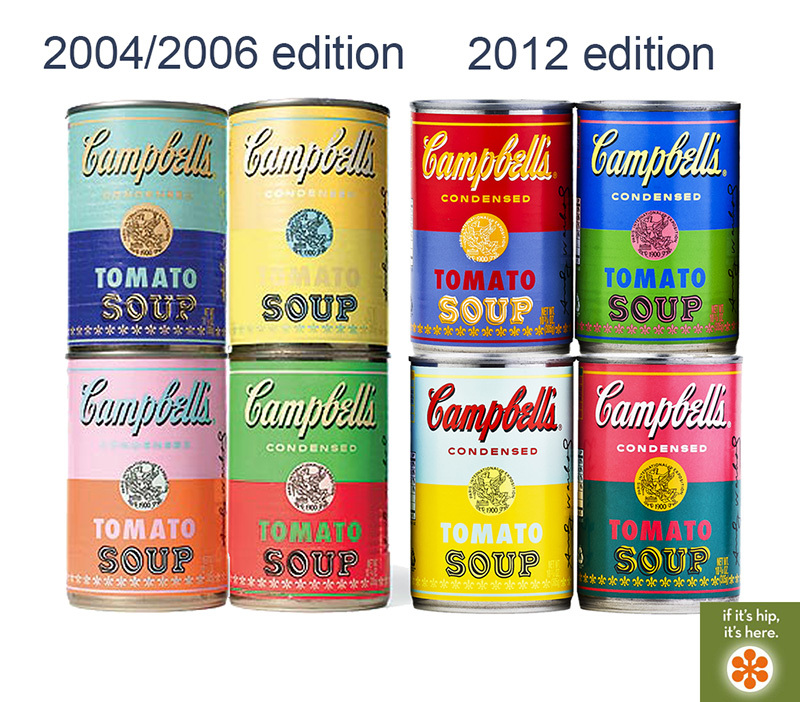 above left: The Warhol-Inspired Cambell's Soup Cans offered in 2004 and 2006 and above right: the new cans offered at Target beginning today. Art and soup lovers everywhere are getting ready to rush out to Target today to buy the limited edition Andy Warhol-Inspired Campbell's soup tomato cans shown below. But those pop art collector's out there know this isn't the first time these have been offered. 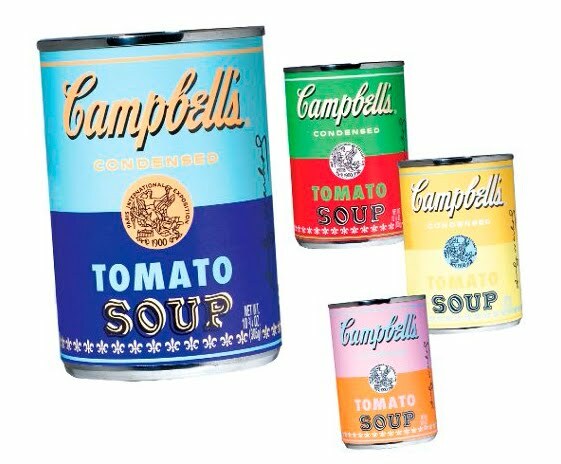 It's actually the third time the Campbell brand has offered soup cans sporting the Warhol style labels complete with printed signature. Although this time, they are featured in colors far more garish with a different layout and Andy image on the back. Another difference is that these will be sold as individual cans for 75 cents each. 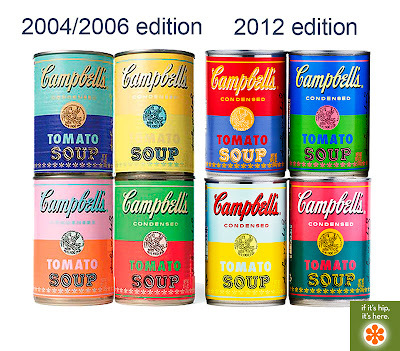 Twice before, in 2004 and 2006, Campbell's offered Warhol-inspired soup cans but they were sold in far smaller numbers, in packs of four and had colors more in keeping with Warhol's actual work. 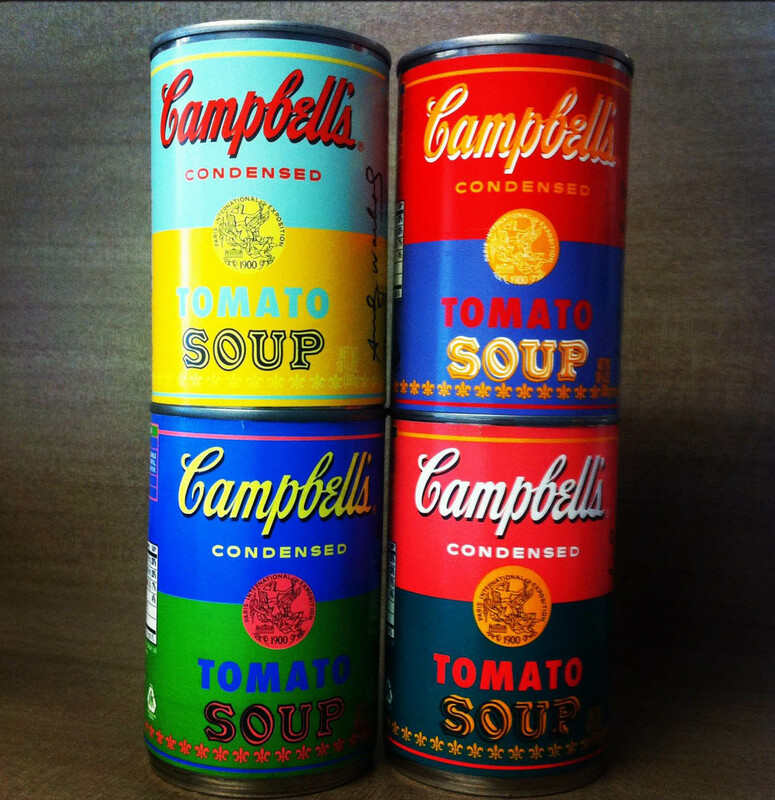 In 2004, Campbell's sold 75,000 four-packs of Warhol-inspired cans at Giant Eagle, a Pittsburgh-based supermarket operator. They rapidly found their way onto ebay and some were (and still are) available through small art galleries such as this one. Then in 2006, for the holiday season, 12,000 units of the same cans were available through Barney's, New York. 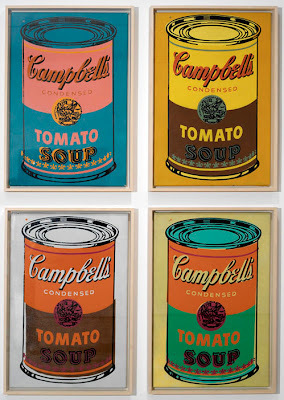 Campbell Celebrates Andy Warhol and 50 Years of Pop Culture History. 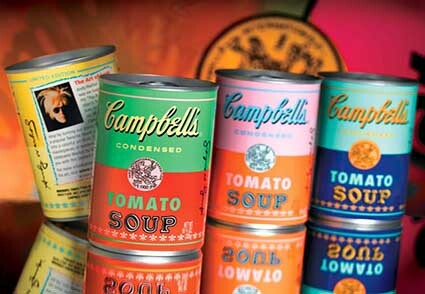 Limited-Edition Cans Commemorate 50th Anniversary of Warhol's Famed Campbell's® Soup Paintings. CAMDEN, N.J.--(BUSINESS WIRE)--Aug. 29, 2012-- To celebrate the 50th anniversary of Andy Warhol's 1962 famed work, 32 Campbell's Soup Cans, Campbell Soup Company (NYSE:CPB) is introducing limited-edition cans of Campbell's® Condensed Tomato soup with labels derived from original Warhol artwork. The four specially-designed labels reflect Warhol's pop-art style and use vibrant, eye-catching color combinations like orange and blue, and pink and teal. 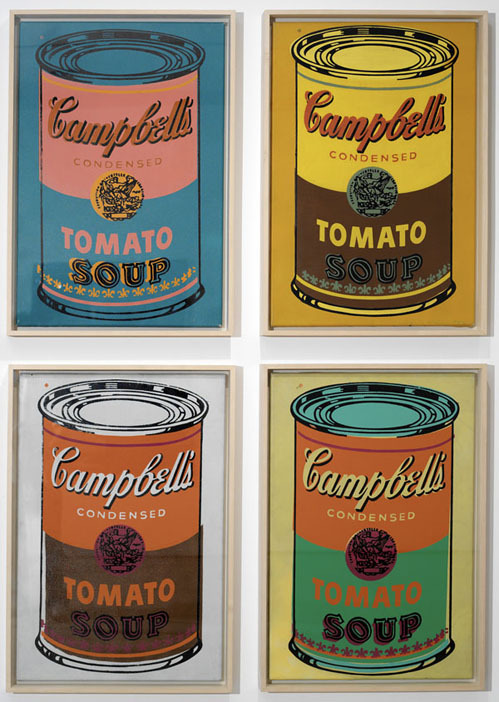 When asked why he painted Campbell's soup cans, Warhol famously quipped, "I used to have the same [Campbell's soup] lunch every day for twenty years1." 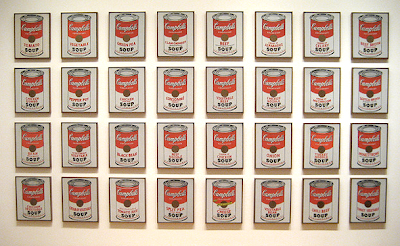 For his first solo gallery exhibition held in Los Angeles in 1962, Warhol exhibited his famous paintings of Campbell's soup - 32 Campbell's Soup Cans. Each of the thirty-two canvases depicted one variety of soup and was displayed side-by-side like cans of soup on a grocery store shelf. The painting helped launch Warhol's career and ushered in Pop Art as a major art movement in the United States. "Campbell's Condensed soup is an iconic brand. And thanks to Andy Warhol's inspired paintings, Campbell's soup will always be linked to the Pop Art movement," said Ed Carolan, Vice President & General Manager, Campbell North America. "This Fall, to honor the golden anniversary of his first gallery exhibit, we'll celebrate Warhol and soup by releasing limited edition Campbell's Tomato soup cans and making Andy's art available in the soup aisle of grocery stores." "In 1962, Andy Warhol changed the trajectory of contemporary art by depicting Campbell soup cans on canvas," said Michael Hermann, Director of Licensing at The Andy Warhol Foundation. "It is only fitting that fifty years later we celebrate the enduring legacy of these two American icons by coming full circle and bringing his art back to the Campbell soup cans that provided him with inspiration." The limited-edition cans were produced under license from The Andy Warhol Foundation, a not-for-profit corporation that promotes the visual arts. Beginning Sunday, Sept. 2, the cans will be exclusively available at most Target locations nationwide for $.75 per 10.75-ounce can, while supplies last. 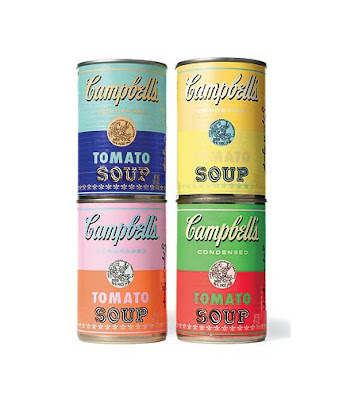 Nearly 40 years after Andy Warhol transformed Campbell's soup cans into art form, Campbell celebrates the pop artist with limited edition soup cans bearing his colorful renditions of the classic tomato soup label. Campbell unveils a special four-pack of Campbell's tomato soup at Giant Eagle supermarkets. The pack features the Warhol-inspired labels instead of the trademark red and white labels that have adorned the can for more than 100 years. 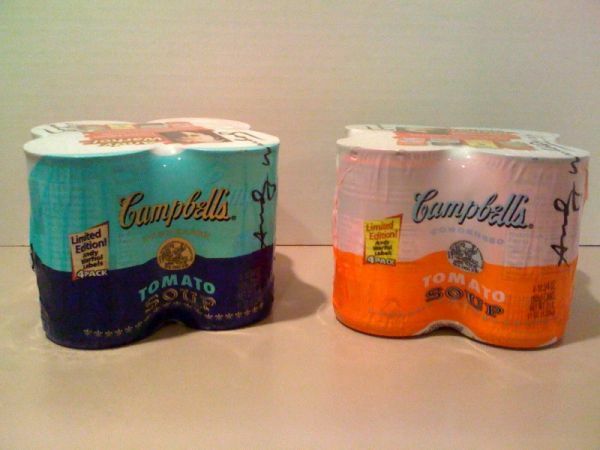 PITTSBURGH, April 14, 2004 /PRNewswire/ -- Nearly 40 years after Andy Warhol transformed Campbell's soup cans into an art form, Campbell is celebrating the pop artist with limited edition soup cans bearing his colorful renditions of the classic tomato soup label. This week, Campbell will unveil a special four-pack of Campbell's tomato soup at Giant Eagle supermarkets. 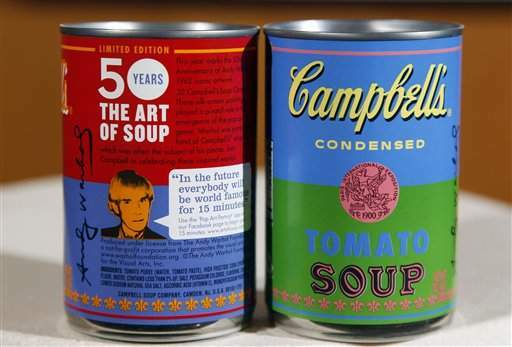 The pack will feature the same best-selling soup that Americans love, only with Warhol- inspired labels instead of the trademark red and white labels that have adorned the can for more than 100 years. Pittsburgh-based Giant Eagle will be the first retailer to carry the colorful cans, which will be on special display beginning April 18 and available for a limited time. The four-pack will contain at least two colorful labels based on the combinations that Warhol created in his silk-screens: green and red, pink and orange, aqua and indigo, or gold and yellow. A copy of Warhol's signature appears on the side of each label. "Giant Eagle prides itself on offering premium products to its customers," says Giant Eagle Vice President of Marketing Kevin Srigley. "We are pleased to partner with a trusted supplier like Campbell's to offer this specially designed package. It's particularly appropriate in the city that Warhol called home." Giant Eagle will offer its customers two special opportunities to commemorate one of Pittsburgh's most famous sons. All customers who show their Giant Eagle Advantage Card(R) will receive $1.00 off admission to the Andy Warhol Museum, which is located in downtown Pittsburgh at 117 Sandusky Street. 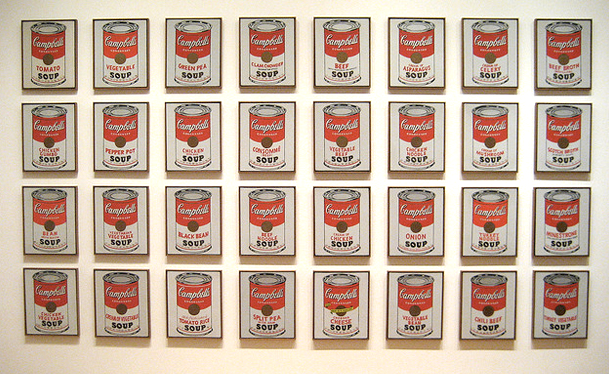 The museum boasts a collection of Warhol's most famous works, including silk-screens of Campbell's soup cans. This offer is available through May 31, 2004. Shoppers who purchase the special Warhol four-pack can also take advantage of an offer for a limited edition Campbell's Andy Warhol magnet set, featuring a collection of four die-cut magnets in the colorful designs of the Warhol labels. Details are available on displays in Giant Eagle supermarkets. So now you know the difference. While the older cans are considered collectibles, given the small amount produced, don't bet on the new cans from Target to help fund your kid's college education. However, at only 75¢ a piece, these are really fun to place on a kitchen shelf, as long as you can get your hands on one before they sell out.